Block title: Choose a title for your document block. 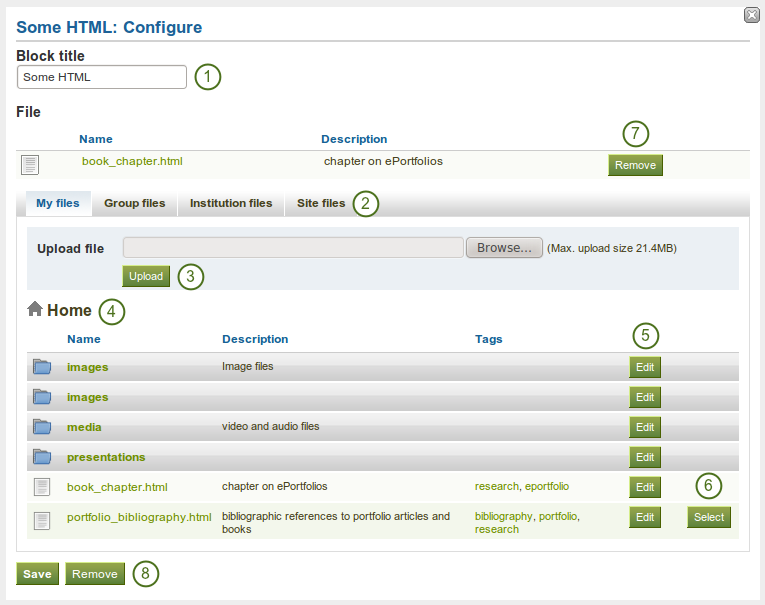 Files area: Choose from which files area you would like to select a file. If you are not a member of a group and not an admin, you may only see My files. If you have access to files elsewhere, these contexts are shown as well, e.g. Group files, Institution files and Site files. You can still edit any component of the file, i.e. its file name, description and tags by clicking on the Edit button. Choose the file or files you wish to display by clicking on the Select button. Click the Remove button to not display a specific file in this block anymore. Click the Save button to accept your changes, or click the Cancel button to leave the block’s content as it is. The Remove button is shown only when you place the block into the page and have not yet added any artefacts. When a user clicks on the Details link, he is taken to the details page for that particular file and sees some more metadata. He could also report the file, print the page or add the page to his watchlist. If you allowed comments on files, a setting that you can add when you edit a file, users could also leave comments on an artefact file directly and not just on a page. Block title: If you leave the title blank, the title of the folder that you choose to display will be used. You can edit any component of the folder, i.e. its name, description and tags by clicking on the Edit button. Choose the folder you wish to display by clicking on the Select button. Click the Remove button if you wish to revert your choice. 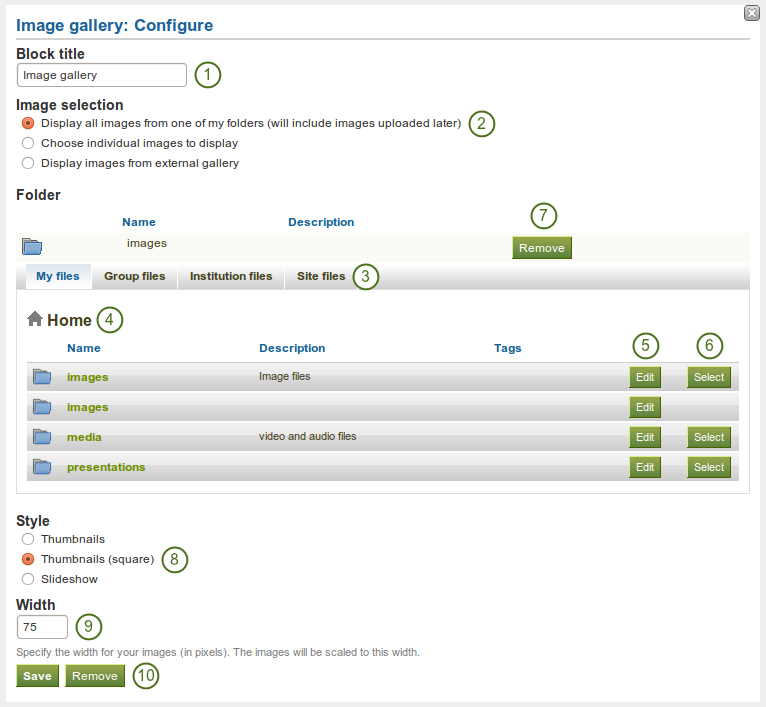 Image selection: You can choose to display all images from a specific folder or you can select the images individually. If you want to revert your selection, click the Remove button. 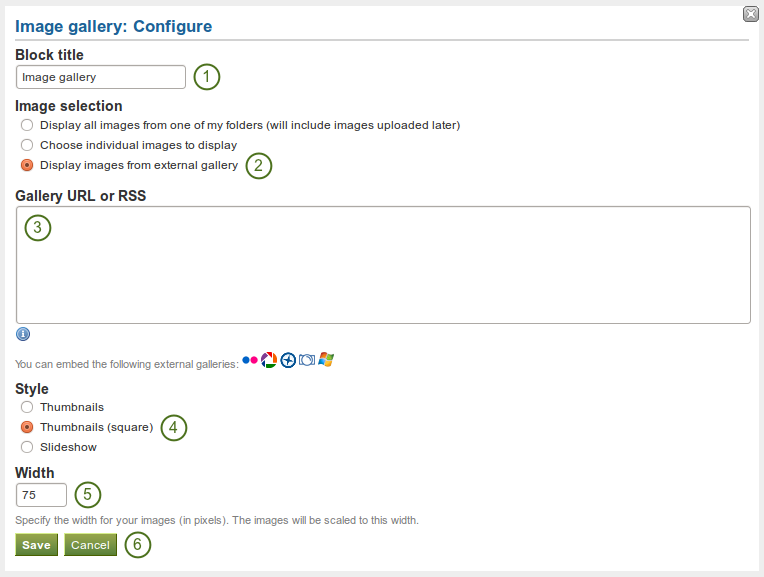 Style: Decide to show all selected images as thumbnails or as slideshow where you only see one image at a time. If you select the option “Thumbnails (square)”, all your images will have the same size. To use Flickr, the site admin has to provide a valid API key. 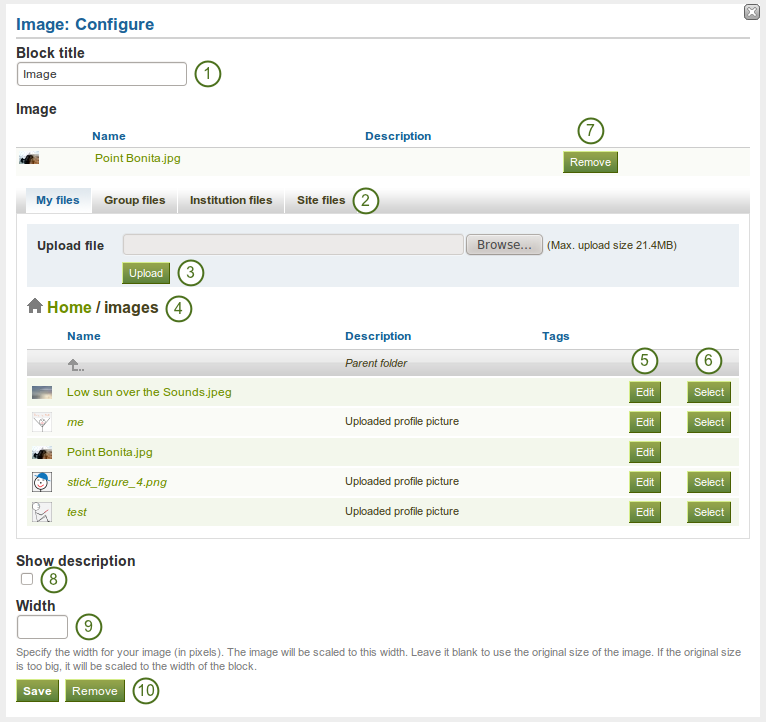 To use Photobucket, the site admin has to provide a valid API key and a secret API key. Choose the file you wish to display by clicking on the Select button. Click the Remove button to not display that file in this block anymore. If your image has a description you can choose to display it. The description could contain the source of the photo for example. Choose the width (in pixels) for your photo. If you do not provide a number, the image will be scaled to the width of the block. 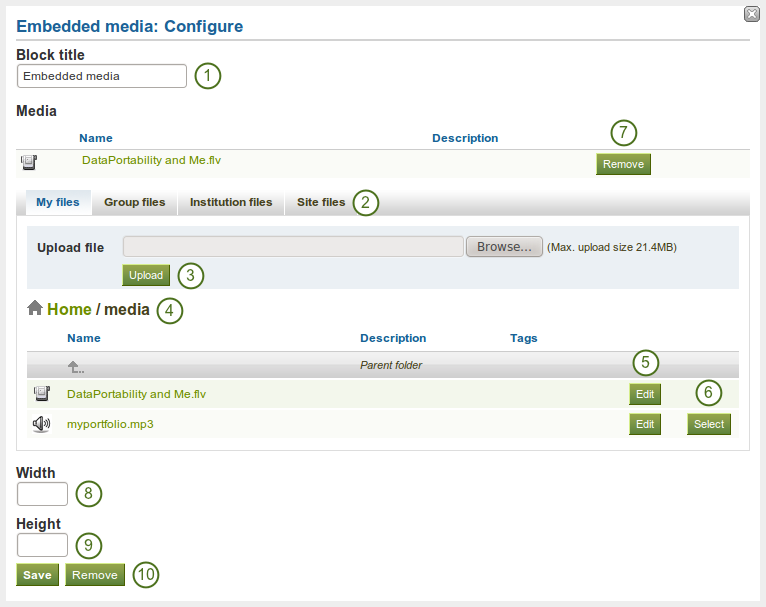 Display an embedded video or audio file from your uploaded files. You can display mp3, mp4 and flv files per default. 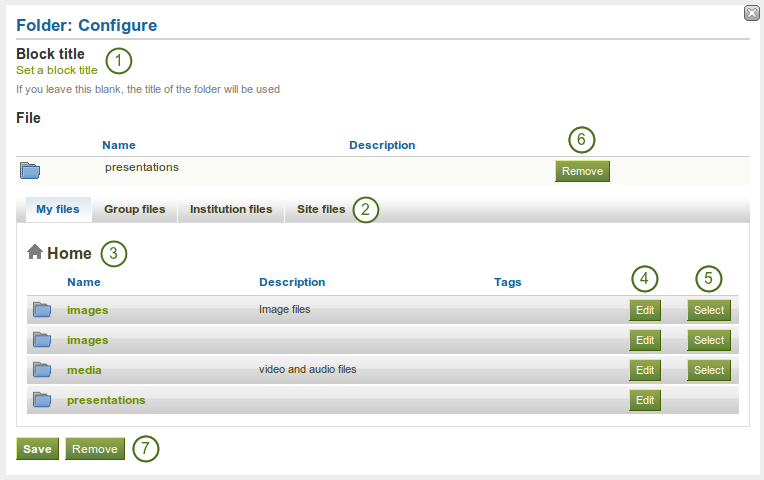 If you wish to display other file types, the site administrator must allow other media formats. These will not be displayed with the built-in media player but require that you have the correct media player installed to display these videos. Width: Choose the width (in pixels) for your video. Height: Choose the height (in pixels) for your video.